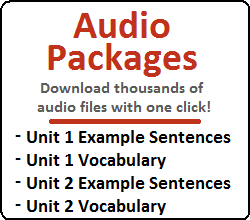 Hover your mouse over any word to see examples of that word in use (you probably won’t be able to understand the grammar within the sentences at this point, but it is good to see as you progress through your learning). 벌금은 얼마였어요? = How much was the fine? 어떤 치마를 사고 싶어요? = Which skirt do you want to buy? Notes: This word is most commonly used to refer to people coming to pick up garbage (garbage collection). You would think that this word wouldn’t be very common (how often do you talk about garbage collection), but it is used fairly often if you live in Korea. 그 파일을 첨부했습니까? = Did you attach the file? 누가 이 옷을 찢었어요? = Who ripped the clothes? This word is often used in greetings, to indicate that one will go, and then come back. 설명은 너무 복잡한가요? = Is the explanation too complicated? 손톱을 왜 이렇게 짧게 잘랐어요? = Why did you cut your nails so short (like this)? 얼마나 많은 돈을 가져갈 거야? = How much money will you take? 이것은 얼마예요? = How much is this? Notes: Used before a counter to ask how many of something. Also used to ask about one’s age. 차가 몇 대 있어요? = How many cars do you have? 친구를 몇 명 만났어요? = How many friends did you meet? 어제 학교에 몇 번 갔어요? = How many times did you go to school yesterday? 뭐 했어요? = What did you do? 뭐 하고 싶어요? = What do you want to do? 뭐라고? = What did you say? 내일 뭐 하고 싶어요? = What do you want to do tomorrow? 지난 주말에 뭐 했어요? = What did you do last weekend? 어제 학생들한테 뭐 가르쳤어요? = What did you teach the students yesterday? 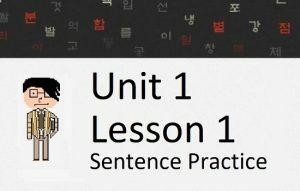 Notes: The difference between 어떤, 무슨 and 어느 is discussed at length in this lesson. 무슨 영화를 보고 싶어요? = What movie do you want to see? 무슨 일을 하고 싶어요? = What work do you want to do? 무슨 생각 해요? = What are you thinking? 내일 무엇을 하고 싶어요? = What do you want to do tomorrow? 아침으로 무엇을 먹었어요? = What did you eat for breakfast? 어제 어떤 남자가 왔어요? = Which man came here yesterday? 어떤 종류의 차를 원해요? = What/which type of car do you want? 어떤 것이 더 좋아요? = Which one is better? 어느 집에서 살아요? = Which house do you live in? 어때? = How is/was … ? 점심은 어땠어요? = How was lunch? Notes: This can be placed before a noun to describe it or to refer to the outside in general. 언제쯤 = Around when? Around what time? 몇 시쯤? = Around what time? Notes: Technically a noun, but usually the translation makes it sound like it is a verb with an emphasis attached to it. 한국에서 며칠 있었어요? = How many days were you in Korea? 오늘은 며칠이에요? = What day is it today? In the previous lesson, you learned about how to make question sentences in Korean. 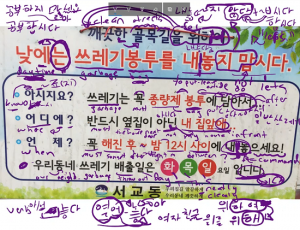 In this lesson, you will build on what you learned in Lesson 21 by learning more ways to ask questions in Korean. Specifically, you will learn how to ask questions using the following words: how, what, which and how many. How beautiful is your girlfriend? You will learn another word (얼마나) later in this lesson to use in those sentences. 그것을 어떻게 해요? = How do you do that? 한국어를 어떻게 배웠어요? = How did you learn Korean? 그 자리를 어떻게 찾았어요? = How did you find that seat? 그 파일을 어떻게 보낼 거예요? = How are you going to send that file? 그 여자에 대해 어떻게 생각해요? = What do you think about that girl? That’s pretty much all you need to know with regards to ‘어떻게,’ but there is still more that you should know about the word 어떻다. The word 어떻다 is rarely used as 어떻다 in sentences. Actually, if you asked Korean people if they thought that ‘어떻다’ and 어떻게’ are the same word, they would probably say that the two are completely different words. In addition to 어떻게, there is another way that you can use 어떻다 in sentences. Through conjugation, 어떻다 can change to ‘어때.” I’ll show you how 어떻다 changes to 어때, but you really don’t need to worry about how it is changed (there are only a few other words in Korean that can take on a similar transformation). 점심 어때? = How about lunch? / What do you think about lunch? 이 사진(이) 어때? = How about this picture? Sounds weird, and most English-speaking people probably couldn’t even understand the meaning of this sentence. Let me explain how each one is used. These two essentially have the same meaning and function. Let me introduce 뭐 first. 뭐 샀어요? = What did you buy? 뭐 첨부했어요? = What did you attach? 뭐 입었어요? = What did you put on/wear? Here, the first person didn’t specifically indicate what he/she ate. The second person is asking for clarification of what was eaten, and can use “뭐를.” Here, “뭐” essentially acts as the noun that was omitted in the previous sentence. 점심을 먹었어? = Did you eat lunch? 무엇을 먹었어? = What did you eat? 무엇을 입었어요? = What did you put on/wear? 이것이 뭐야? = What is this? 이름이 뭐예요? = What is your name? 점심이 뭐야? = What is (for) lunch? 무슨 also translates to “what” but it is instead placed before nouns to describe them. 그 영화를 보고 싶어요? = Do you want to see that movie? 무서운 영화를 보고 싶어요? = Do you want to see a scary movie? The dictionary form of 무슨 is 무슨. Although it looks like an adjective with ~ㄴ/은 attached to it, the word itself is 무슨, and thus, is not actually an adjective. However, it looks and feels like an adjective because of how it is used in sentences. 그것이 무슨 냄새야? = What is that smell? 무슨 생각(을) 해? = What are you thinking? 그것이 무슨 소리야? = What is that sound? 무슨 말이야? = What do you mean? 무슨 냄새야? = What is that smell? Sounds simple enough, right? Let’s talk about other words that are often confused with 무슨. 어떤 영화를 보고 싶어요? = Which movie do you want to see? 그 차를 사고 싶어요? = Do you want to buy that car? 비싼 차를 사고 싶어요? = Do you want to buy an expensive car? 무슨 차를 사고 싶어요? = What car do you want to buy? 어떤 차를 사고 싶어요? = Which car do you want to buy? The first question every learner has when learning about 어떤 is how it can be differentiated from 무슨. 어떤 usually translates to “which” and 무슨 usually translates to “what.” Their meanings are very similar and their respective English translations don’t really give any hints as to what the differences between the two are. The difference is subtle, and at this point you don’t really need to fully understand how they are different. The difference is even hard for Korean people to understand, and using one of them in place of the other usually creates a sentence with essentially the exact same meaning. That being said, let me give you a brief introduction of how they are different. In the case of asking questions, 어떤 is used for two main reasons. For example, in: “어떤 차를 사고 싶어요?” Maybe you are selling cars and giving a person a selection of cars to choose from. Here, although you technically don’t know the answer to the question, you can assume that it will be from a limited number of choices given. However saying “어떤 냄새야?” in most situations would be ridiculous. It could only really be used if you are asking a person to tell you about the characteristics of a smell they are smelling. For example, imagine if you had a bouquet of flowers and put the flowers to your friend’s nose. In this case, you want your friend to describe the characteristics of the smell – “Is it a nice smell? A fresh smell? A rosy smell?” The answer to this question would likely be describing (the characteristics) of the smell. (In theory, the speaker would have given the listener a choice to choose from, or would be asking about the type of movie the listener wants to see [for example, a comedy, a horror movie, or a love story]). Just when you thought you might actually be understanding this confusion, we have to look at another word with a similar meaning. Another way you can ask this type of question is with the word 어느. Like 무슨 and 어떤, 어느 is placed immediately before nouns. 어느 영화를 보고 싶어요? = Which movie do you want to see? In the case of asking questions, 어느is used in a similar way to the first explanation I gave of 어떤 from above. That is, “to choose from a selection of options.” It would not be used to refer to the type of characteristics or properties of an object, and it would not be used to refer to something unknown. 무슨 집에서 살아요? = What house do you live in? 어떤 집에서 살아요? = Which house do you live in? 무슨 대학교를 다녀요? = What university do you go to? 어떤 대학교를 다녀요? = Which university do you go to? 어떤 쪽으로 가고 싶어요? = Which way do you want to go? 어느 쪽으로 가고 싶어요? = Which way do you want to go? 무슨 치마를 샀어요? = What skirt did you buy? 어떤 치마를 샀어요? = Which skirt did you buy? 어느 치마를 샀어요? = Which skirt did you buy? This table is equally confusing, but it helped me organize my thoughts, so I thought I would present it here as well. I have attempted to organize the main usages of 무슨, 어떤 and 어느. Object is unknown 무슨 냄새야? What is that smell? 어떤 냄새야? Could be okay, but it would be referring to the characteristics of the smell, not the source. 어느 소리야? Characteristics 그 사람이 무슨 사람이야? What type of person is he? 그 사람이 어느 사람이야? More in Lesson 33 무슨 차를 사고 싶어요? (This fits in with the “object is unknown” usage) 어떤 차를 사고 싶어요? (This could also be referring to the characteristics/type of car) 어느 차를 사고 싶어요? This is a good start, but there are other specific situations when you might use one of these words. For example, 어느 has other usages as well. 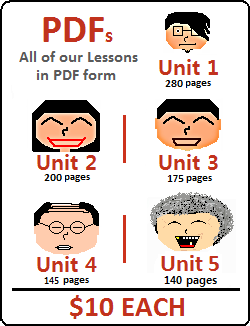 You will learn about some of the other usages of 어느 in Lesson 25 and Lesson 72. In addition, as 어떤 and 어느 are used when options are given, we will continue to talk about these words in Lesson 33 when you learn how to give options to people. 파일을 몇 개 보냈어요? = How many files did you send? 그 종이를 몇 번 찢었어요? = How many times did you rip that paper? 차 몇 대가 있어요? = How many cars do you have? 친구 몇 명을 만났어요? = How many friends did you meet? The difference between the first three sentences and the last three sentences is the first three are questions and the last three are statements. Remember when you are asking a question that the intonation needs to rise at the end of the sentence. 너의 남동생은 몇 살이야? = How old is your younger brother? 여자 친구는 얼마나 예뻐요? = How pretty is your girlfriend? 축구를 얼마나 잘 해요? = How well do you play soccer? Speaker is not making a distinction between countable objects. Here, the speaker’s inquiry falls within an uncountable continuum. 빵을 얼마나 먹었어요? = How much bread did you eat? 그 여자를 얼마나 사랑해요? = How much do you love that girl? 돈을 얼마나 가져갈 거예요? = How much money will you take? 물을 얼마나 마셨어요? = How much water did you drink? 그 책상은 자리를 얼마나 차지해요? = How much space does that desk take up? 빵을 얼마나 많이 먹었어요? = How much bread did you eat? 그 여자를 얼마나 많이 사랑해요? = How much do you love that girl? 돈을 얼마나 많이 가져갈 거예요? = How much money will you take? 물을 얼마나 많이 마셨어요? = How much water did you drink? 그 책상은 자리를 얼마나 많이 차지해요? = How much space does that desk take up? Using 많이 in the sentences above just stresses that the speaker knows that the answer is “a lot” (remember, the meaning of 많이 is “a lot” or “many”), and is sort of asking “okay, I know it is a lot, but how much a lot?” (I realize that sentence is grammatically incorrect). 얼마나 많은 빵을 먹었어요? = How much bread did you eat? 얼마나 많은 돈을 가져갈 거예요? = How much money will you take? 얼마나 많은 물을 마셨어요? = How much water did you drink? 빵을 몇 개 먹었어요? = How many pieces of bread did you eat? 몇 명의 여자를 사랑해요? = How many girls do you love? Note that although “얼마나” translates to “how” in all of these usages above. This is different from the usage of 어떻게 which also translates to “how” in English. The word “얼마” can be used to ask how much something costs. 얼마나 and 얼마 are technically not the same word. However, I am presenting 얼마 in this form here because it is very common and it is in the form of a question. 그 로션이 얼마예요? = How much is that lotion? 저 바지가 얼마예요? = How much are those pants? 이게 얼마예요? = How much is this? Remember, 이게, 그게 and 저게 are contractions of 이것이, 그것이 and 저것이 respectively. Person 1: 슬기야! = Seulgi! Person 2: 왜? = Why/what do you want? Person 2: 왜? = Why (will you go to Canada tomorrow)? Person 2: 언제? = When (will you go to Canada)? Person 2: 어디? = Where (will you go tomorrow)? Person 2: 누구(를)? = Who(m) (will you meet)? Person 2: 누가? = Who (will come here)? Person 2: 어떻게? = How (will you go to the airport)? That’s it for asking questions in Korean! There was a lot of content in this lesson and the one before it (Lesson 21). Make sure you review those concepts a lot, because they are very important! Before we move on to the next lesson, though, we need to revisit ~는/은 and ~이/가 again. Now that you have continued to increase your understanding of Korean grammar over the past few lessons – and specifically learned how to ask questions in Korean, I can continue to explain the nuances between ~이/가 and ~는/은. If you just walked into a room without anybody saying anything to you, or without any prior back-story, and simply said “내가 밥을 먹었어” (despite being able to understand you perfectly) it would sound very awkward to Korean people. When you use ~이/가 over ~는/은, the speaker is putting an enormous amount of stress on the fact that it was that particular subject that did the action. The speaker isn’t comparing anything, but specifically stressing that it was the subject who/that does the action in the sentence (or has the properties described by the adjective, or “is” the thing attached to 이다). Again, this is just a nuance, and cannot be expressed in translation to English. The only way it can be explained is through descriptions. Note here that I wouldn’t actually translate “내가 밥을 먹었어” to “I am the one who ate rice.” I would still translate it to “I ate.” I am using the translation “I am the one who ate” to show how the stress can be on the subject. Note that here, you are not comparing anything. You are also not stating a general fact. You are just indicating the subject of the sentence. How can I know that nothing is being compared? How can I know that this isn’t just a general fact? How can I know that ~는/은 is just acting as a plain old subject marker? This is precisely what causes the confusion amongst foreigners when trying to distinguish the difference between ~이/가 and ~는/은. Both of them can be used to express more than one nuance. The only way you can distinguish between the particular nuances being used is by understanding the situation in which they are used. At this point I would like to dive a little bit deeper into this purpose of stressing the subject of a sentence. Like I said, to have this purpose, it would need some sort of back-story indicating why the speaker would need to stress the subject. In this situation, the speaker is stressing that it is he/she that is the class president, and therefore has the power to solve the situation. I waited until Lesson 22 to talk about this usage because now you know how to ask questions. The particle ~이/가, in its usage as a subject stressor, is used when somebody specifically asks “who” did a particular action. 누가 밥을 먹었어? = Who ate the rice? 누가 피자를 만들었어? = Who made the pizza? Notice here that just because (in English) somebody asks a “who” question doesn’t mean that ~이/가 must be used on the subject. This is only relevant when the speaker is asking “who” the subject was – and not who the object was (in effect, when “who” translates to 누가 and not to 누구”). 누가 그녀를 좋아해? = Who likes her? 너는 누구를 좋아해? = Who do you like? Notice above the question is asking who the object is. The use of “는” on the subject takes the stress off of the subject and “는” just acts as a subject marker. I can’t stress enough that all of these nuances are all situational. They will tell you that – depending on the situation – they could be exactly the same. It entirely depends on the nuance that the speaker is trying to make. 사과는 빨갛다. 바나나는 노랗다 = Apples are red. Bananas are yellow. 날씨가 좋다 = The weather is nice! 비가 와요 = It’s raining! 내가 반장이야! = I am the class president! In that lesson, I told you that you should use ~이/가 on the object that is in the state of something. I can only assume that the purpose of this is what is described in number 2) above. That is, “the door being open” is not some general statement because (obviously) not all doors are open. Rather, the speaker is referring to a particular door in a particular situation that is open, and thus, requires the use of ~이/가. Adding ~는/은 to “문” (or any other object in that situation) would only be acceptable in a comparison situation. Your understanding of this will progress along with your understanding of Korean in general. Through Lesson 2, 17 and 22 I hope you have a better understanding of this. However, I know that you will still be confused. Don’t worry, that is normal, and I promise your understanding will evolve as you keep progressing with your Korean. In our later lessons, you will continue to be introduced to when it is more appropriate to use either ~는/은 or ~이/가. For now, focus on what we have learned so far.